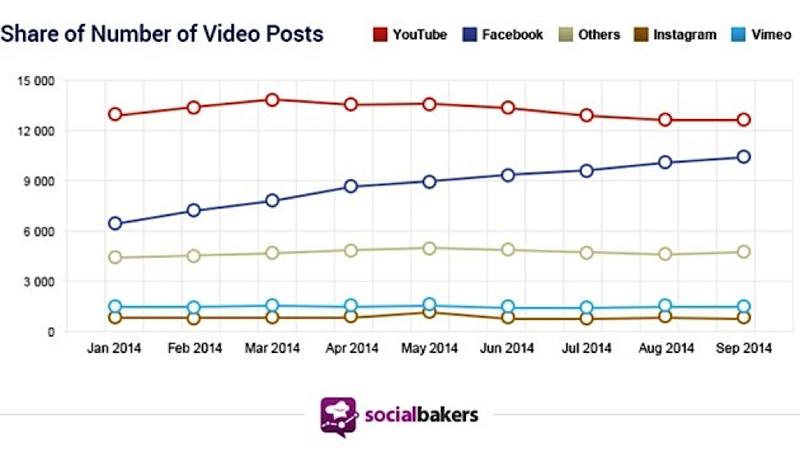 Video is quickly emerging as one of the top mediums of choice for marketers. And with good reason. As humans, we’re all cognitive misers. We don’t want to spend a lot of mental energy consuming information that may or may not be important, so we look for ways to efficiently take in information and exclude the details that aren’t necessary. That’s part of the reason video works so well — it’s easily digestible. Using video in e-mail leads to a 200-300% increase in click through rate, and including a video on a landing page can increase conversions by 80%. B2B companies especially are seeing huge benefits through video marketing: 73% of B2B companies that use video marketing see significant ROI from it. Video can also help cement your company’s message in the minds of your target audience. People are only likely to remember 10% of the information they hear three days later, but if you pair information with video, then people remember 65% of information. Video marketing doesn’t just entail viral videos on YouTube or high-end, commercial-quality videos that brands produce. They can be used at all points throughout the buyer’s journey. Different types of video content can be used to move your customers along their journey towards purchase in a more effective way. We’ll go over exactly how to do this in detail in this post. But first, let’s cover what kind of video content you can create at each step of your funnel, and then we’ll focus on a few specific types of video marketing (Facebook video, YouTube, and explainer videos). Notice that only a small fraction of your video content should be geared towards attracting new prospects at the top of the funnel. 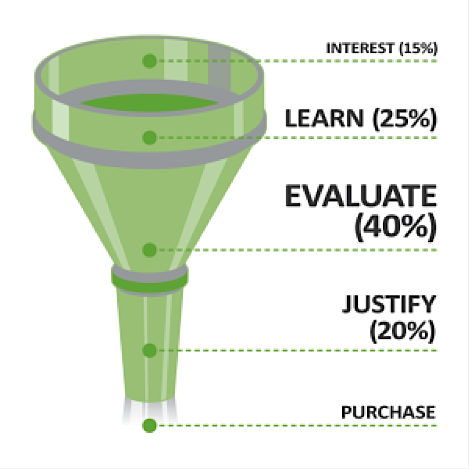 Most of it should be evaluation stage content at the middle of the funnel. Before we dig into different video marketing tools, tactics, and case studies, let’s break down the type of content to create at each part of the funnel. Free Bonus Download: Get ready to receive the perfect accompaniment to video marketing with this detailed guide on YouTube video advertising! Click here to download it free. At the top of the funnel, your prospects might not have a complete understanding of their problem and won’t be aware that your company exists, so TOFU content should appeal to as many people as possible. It needs to be in an authentic, conversational tone and delivered in a format that most people would enjoy. Content libraries. By creating a comprehensive video hub on your website that covers a variety of questions on your topic, you can quickly position yourself as an authority in your field in the eyes of prospects who are still in the first stage of the buyer’s journey. Content libraries also help with SEO because they make use of the hub and spoke strategy, which is one of the best approaches to building an authoritative publication that ranks high in search. The idea behind the hub and spoke strategy is to create a main “hub” of content that covers a variety of information on one related topic, and then create many spokes that delve deeper into the topic introduced by that hub. The Chicago-based coffee company Intelligentsia Coffee made use of the hub and spoke strategy by creating a hub of content which includes a number of brewing guides all related to coffee. Wistia is a company that provides video marketing solutions for businesses, and they’ve created a content library that covers a range topics that would be of interest to potential customers in the area of production, video marketing strategy, and more. Webinars. Webinars are also a great way to move prospects down the funnel quickly. You can repurpose your blog posts, e-books, and other guides into webinars at the top of the funnel. For example, KISSmetrics made use of top of the funnel webinars to drive more sales for their business. 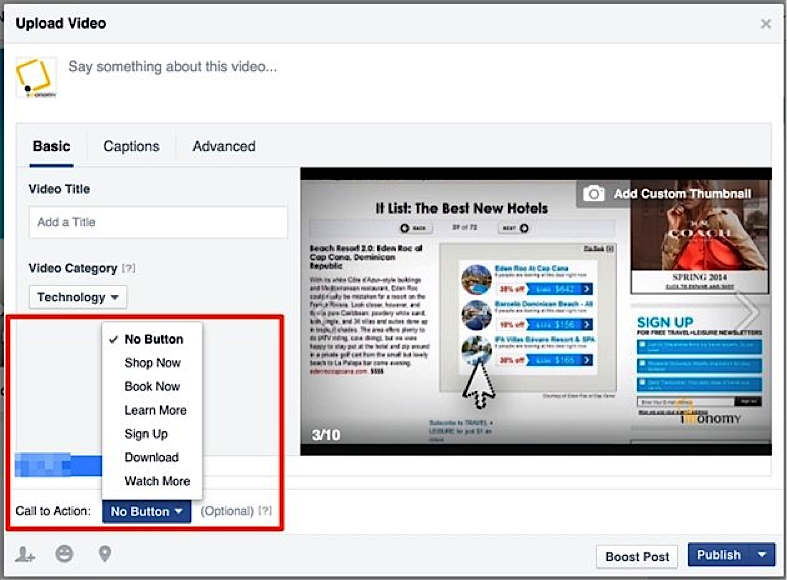 Facebook video marketing. There are different types of video marketing options on Facebook, such as creating a live stream for followers and fans of your business. Facebook live streams have a similar context as Snapchat in that they can be informally produced or used to show “behind the scenes” footage of your business to create a deeper relationship with your customers. Facebook’s news feed algorithm prioritizes content that people consume and share the most, so quality Facebook video content ends up getting more reach than videos on YouTube and consequently is a great way of both engaging with existing customers and expanding your reach to new prospects. 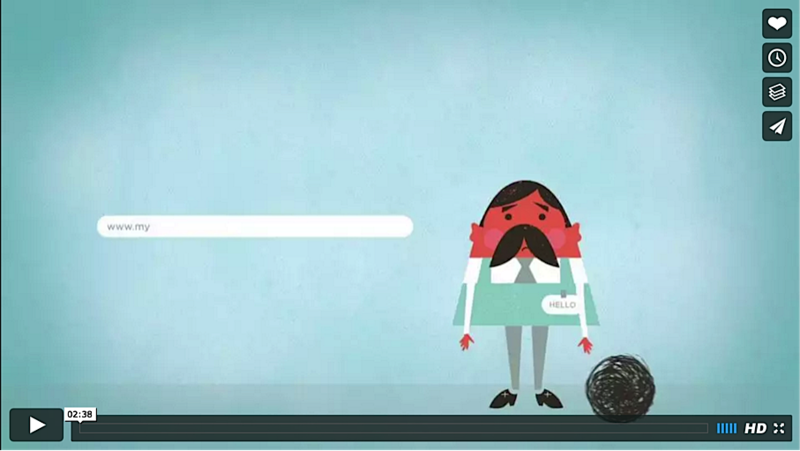 Explainer videos. Explainer videos are short videos that serve to introduce your product to a wide range of customers. This is the type of video that you might put at the top of your landing page to give prospects a quick sense of what you do and how you can help them. The video doesn’t get too deep into the details of the product, but it does dig into the audience’s pain points, give a sense of the brand and its values, and show screenshots of the product in use. YouTube videos. At the top of the funnel, your main priority should be to meet your prospects where they are through your content and collect their e-mail addresses so you can build a relationship with them as they progress through the journey. Charisma On Command, a business that sells social skills courses, uses YouTube videos to display educational content that relates to what their target audience is searching for. What many people don’t realize is that YouTube can also be an effective way to rank higher in organic search. If you craft a good description under the video, it will help with your SEO. For example, when you type “how to read anyone” into Google, the first thing that pops up is Charisma on Command’s YouTube video. Interviews with thought leaders. One of the most effective ways to build authority in an industry is by associating yourself with others who have already done so. By recording interviews with influencers in your industry, you can appeal to their audience while making yourself look more credible to your own prospects who are hearing about you for the first time. We interview entrepreneurs and marketers on our Growth Everywhere podcast. Here’s an example of an interview with Jason Lemkin about how he grew Echosign To $100M In Revenues. Showcase your company culture. B2B companies tend to come off as too serious in their presentation when they create content. While it is important to be professional to show your audience that you take your customers and your business seriously, you can also build a deeper level of trust with your audience by showcasing a more personal side of your company culture through video. According to Wistia, afterwards the submission rate for surveys shot up to 65%. Video is one of the best mediums to highlight your company’s unique “vibe” and show your customers what you’re like behind the scenes. Top of the funnel content is meant to educate your prospects and teach them about your business, and then convert them to an e-mail list so you can build a long-term relationship with them. So MOFU content should be focused on helping leads evaluate their purchase decision and teaching them why your product is the best fit for them. Product demos. If your company sells B2B products, then this is the stage where you’d send out an e-mail to a lead asking if they’d be interested in a product demo. You could also offer a product demo at set times throughout the week, similar to a webinar. 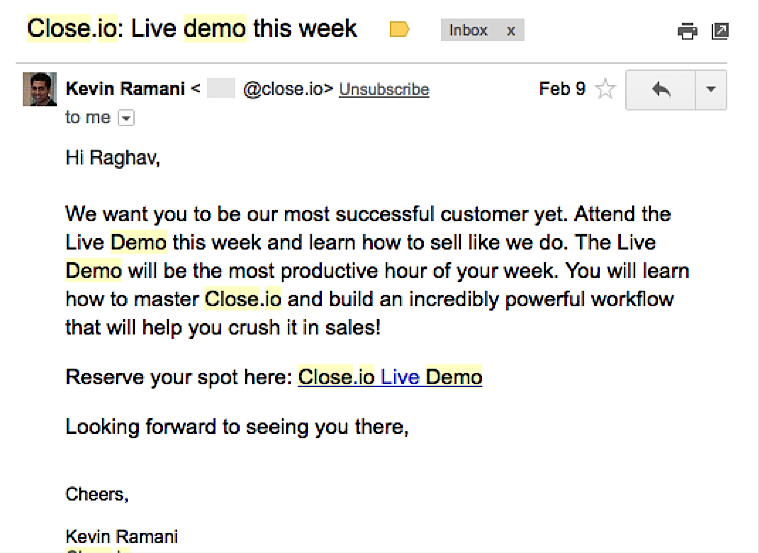 For example, Close.io sends out e-mails to their leads when they have a demo scheduled. Client testimonials. Testimonials provide social proof that you can actually deliver on the promises that you claim you can deliver on. In fact, 84% of people trust recommendations from people they know over any type of advertising. And video is the best medium in which to deliver testimonials because they can’t be easily faked. Vidyard has some great tips on how to craft convincing testimonial videos, like the importance of keeping your videos benefit driven, and showing how a customer transformed from before they started using your product to after. By infusing authenticity and personality into your client testimonials, filming them in their natural environments, and getting them to show their human side, you can create authentic endorsements for your product in a way that almost feels like a word-of-mouth referral from a friend. Case studies. Video case studies are more in-depth forms of client testimonials — kind of a mix between “how-to” videos and testimonials. Good case studies show your customer’s transformation from before they started using your product to after, but they also go into more depth on the numbers and the exact strategies a customer used to get a specific desired result. Check out this series of video case studies by WatchGuard, a network security company. Video marketing can help build trust, which boosts conversions, and sales videos can increase purchase intent by 67%. Video marketing content at this stage can overlap a little bit with content at the middle of the funnel. For example, case studies, testimonials, etc. are also helpful for closing a new customer. You can use your FAQ videos to address common questions that people have about your product and frame it in a way that addresses their concerns. 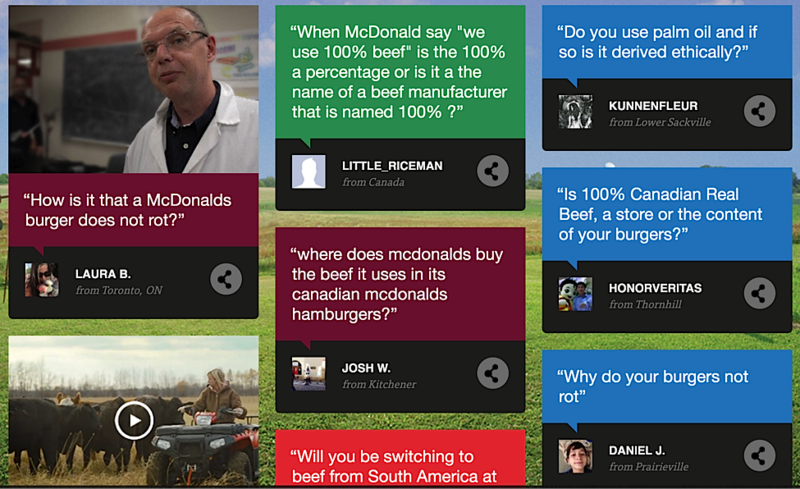 For example, McDonald’s Canada created a series of FAQ videos that talk about the ingredients and the way they make their products. Instructional videos. One of the biggest fears that customers have before making an expensive purchase, especially in B2B environments, is that they might not get adequate support after handing over their hard-earned cash. A great way to prove that you’re invested in their success even after they purchase is through a series of instructional videos. Once you watch this, you know that the product will do what it promises to do, you know that easy-to-understand instructions are available once you purchase it, and it shows proof that the company is willing to support their customers after they’ve made a purchase. Now that we have an idea of what video marketing looks like at every step of the buyer’s journey, let’s dig into some marketing tactics and case study examples on a few specific platforms. Over 76% of Facebook’s users view video content on their news feeds, and that number is extremely high, considering that Facebook has 1.04 billion daily active users. 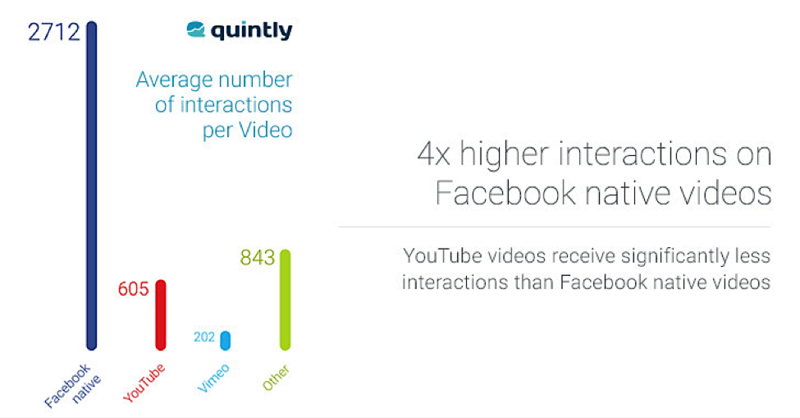 The type of video content that performs best on Facebook (i.e. the videos that had the highest completion rate) are videos that are shorter than 21 seconds. In order to make sure that your top-of-funnel videos are consumed by as many people in your target audience as possible, it’s best to create highly visual videos with minimal narration so that people can watch and understand the information in the video without much effort. One of the best ways to get people hooked on your brand is by offering “quick wins” that allow them to get some fast solutions to their problems. Providing weekly quick tips via Facebook videos is a great way to do this. 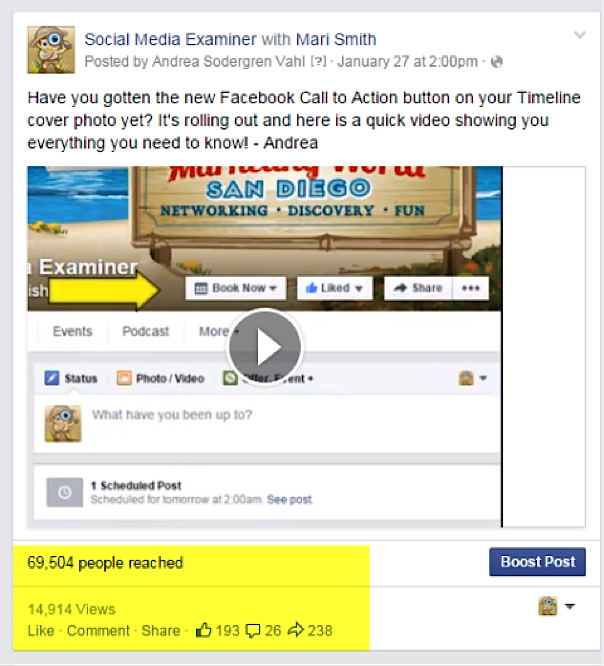 For example, Social Media Examiner features “hot tips” on their page every Tuesday which has done well for them in terms both engagement and reach. Before the Super Bowl, Lowe’s created a series of videos that show people making games, small tables, and other fun products to use on game day using Lowe’s supplies. Each of their videos got half a million views in less than a week. 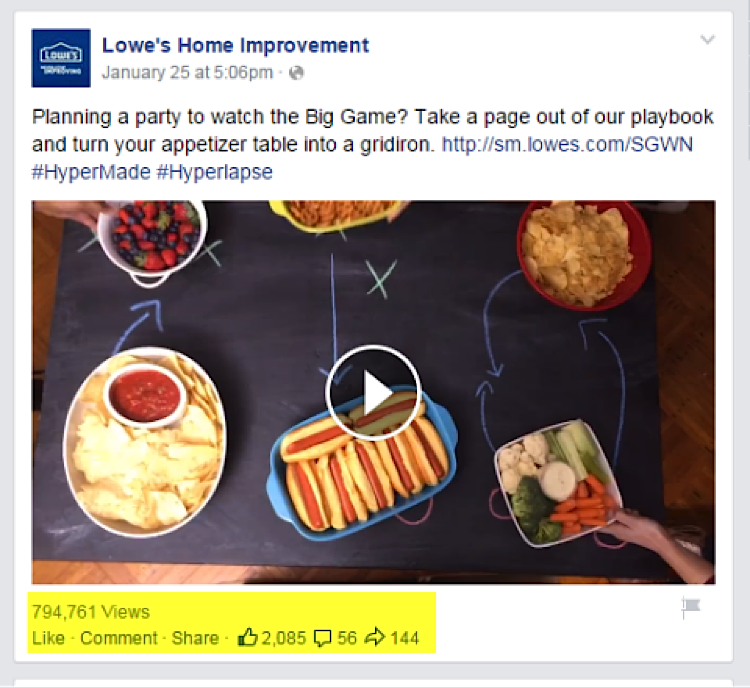 Another example of a company that does Facebook video marketing well is Kraft Foods. According to Marketing Profs, Kraft’s A1 Steak Sauce sales were lower than expected in early 2014, so they created a Facebook video ad campaign to boost sales. They made a fun, entertaining video that blended the A1 Steak Sauce brand and Facebook relationship statuses together. The video went viral. 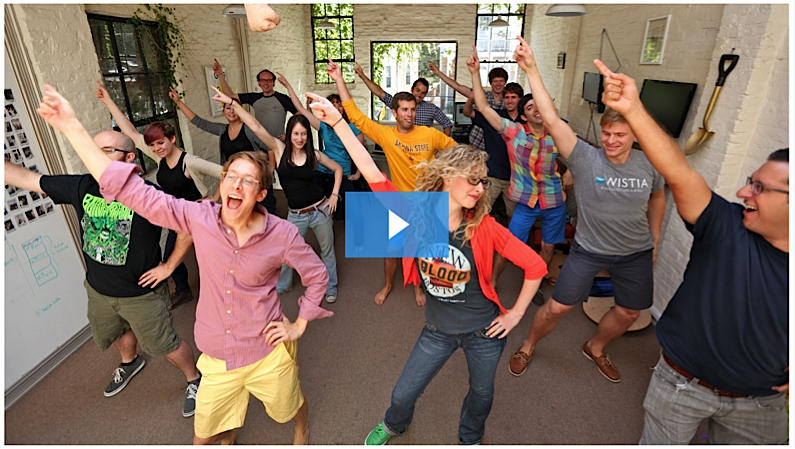 It got 1.3 million views, 3,800 likes, and over 220 comments — with a small marketing budget. Once you upload your videos to the public, you then have to monitor your video’s effectiveness and reach. 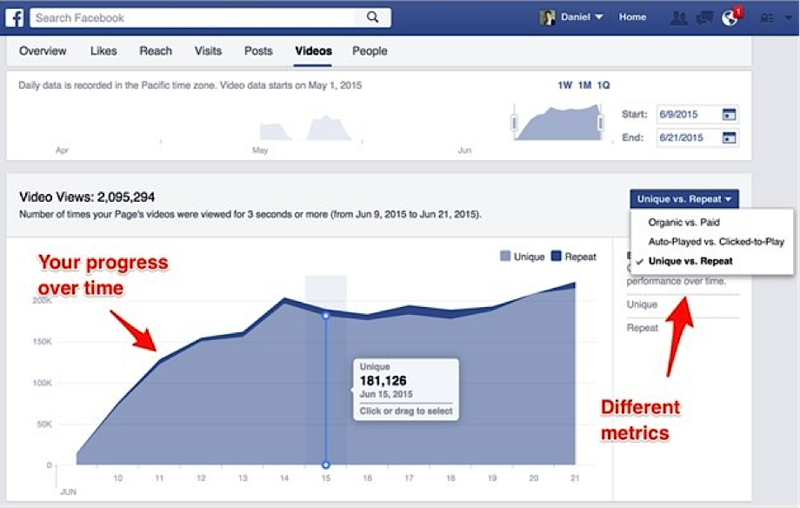 On Facebook, the way to do this is through Facebook Insights on your Facebook page. You can check out how your videos are performing in terms of audience engagement. On your Facebook page, you can also click on the “videos” tab, where you’ll get a deeper sense of the metrics related to each video. Once you’ve shared your video on Facebook, it’s important to craft a call to action so that you can push your viewers into the next stage of your funnel. For example, if you’re creating videos that will be seen by prospects who haven’t signed up for your email list yet, then you might want to have “Sign Up” as your call to action. If your goal is to drive people to a landing page to make a purchase, or direct them to a page with more content, then you might want to have “Learn More” as your call to action. Similar types of videos tend to do well on both Facebook and YouTube, with the main difference being the user experience of the products. For example, when people browse through their Facebook feed and they come across a video, it automatically starts playing. The problem with this is that many users are watching without headphones or for whatever reason aren’t able to turn on the sound. Because of this, Facebook videos need to be able to function without sound — either with subtitles or other visuals. YouTube users usually watch videos with sound, but because they come to YouTube specifically to watch videos, production quality becomes a lot more important. So filming yourself with a smartphone won’t get you the same reach and popularity as it might on Facebook. Storytelling/writing. Good storytelling is what’s missing from many online videos. Some businesses believe that their services or products are too “boring” for them to be able to create interesting videos about them. But there’s always a way to create interesting content on a “boring” business — it just depends on how you tell the story.For a good example, check out this YouTuber giving a review of the food at Five Guys. Notice how his personality and message tie together to craft a video that you love watching. Editing. Editing is on the the most frustrating, time-consuming parts of video production, but it’s also the most important because this is what brings you your video quality. Composition. When it comes to composition, most people don’t know what they’re doing. They’re so focused on delivering the information in the video that they don’t pay much attention to how it is actually shot — the visual aspect of communicating your story. Social Networking. And of course, you can make the best video in the world, but if you aren’t getting it out there, does it really even exist? SEO. Remember, creating a great video is only half the battle. Making it findable is the other half. You can ensure that people will find your awesome video by implementing Keyword Research, Title Tag Optimization, Description Optimization and creating a Video Transcript. When done right, explainer videos help you convert more cold prospects into warm leads. There are different components to quality explainer videos and all of them need to be in place for the video to be high converting. While it can be good to add in some entertainment and fun, this isn’t necessary. What matters most is conveying what your company does and answering your prospect’s questions about your product. Before you can write a high-quality script, you need to understand at a deep level what your audience really wants. For that, it’s best to create a survey. You can use a service like Qualaroo to get a better understanding of the state of mind your target audience is in when they visit your site. 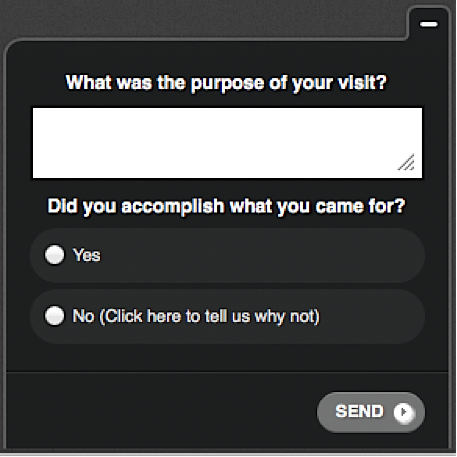 Qualaroo allows you to get data on what your website visitors are looking for by displaying a small pop-up on the bottom of their screen in which they can enter their responses to a specific question. What’s the biggest hesitation you have right now that’s keeping you from buying? Do you find anything confusing on this page? By getting a sense of the objections and emotions that are going on in the mind of your audience, you’ll be in a better position to create a quality script to address those objections and move them to the next step in your funnel. Video marketing offers businesses the opportunity to build a relationship with their prospects in a way that other platforms (like blogging, e-mail marketing, etc.) do not. There a variety of ways to use video to grow your business and become closer with your audience. How will you start using video marketing? Leave your comments below!